Food Costs > How Much Does a Lobster Tail Cost? How Much Does a Lobster Tail Cost? The lobster tail is considered to be one of the best tasting parts of the lobster and is considered a delicacy in most restaurants. 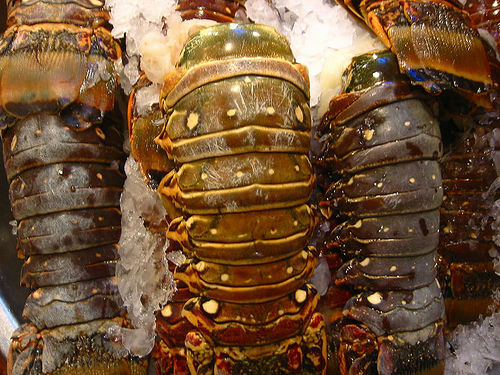 Easy to prepare, a lobster tail can be found at most grocery stores and seafood markets. The cost of a lobster tail will depend on the market conditions, where you live, where you are purchasing it from and what kind you’re purchasing (warm vs. cold). On average, a pound of lobster tail is going to cost anywhere from $20 to $30 per pound. With the average lobster tail weighing about six ounces, be prepared to spend about $25 for two tails at a local grocery store or online. 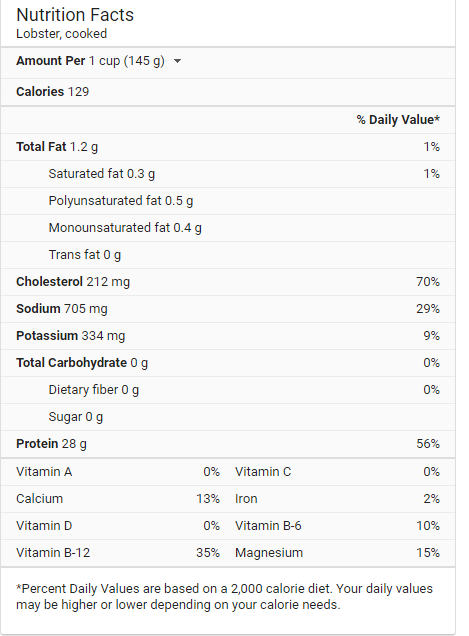 Cold water lobster tails, according to ReluctantGourmet.com, can cost about $5 more per pound. At Sam’s Club, for example, two lobster tails sourced from the Bahamas retail for close to $21 per pound at the time of this writing in 2017. Costco charges closer to $90 per box, with about eight to nine tails weighing close to seven ounces each. At Kroger, a five-ounce package retailed for close to $7, while their eight-ounce wild caught lobster tail package retailed for $21. On Amazon.com a few of the best sellers were in the $2 per ounce range. If you were to want the meat harvested from the tail, then the costs could increase to about $50 to $65 per pound. At the Yankee Lobster Company, for instance, they charge $55 per pound. Commonly sized lobster tails, when purchased at a local grocery store, can range anywhere from as little as four to 14 ounces. When it comes to a lobster tail, you will find either a warm or cold water tail. A warm water tail will primarily come from warmer waters such as Florida, the Caribbean and Latin America, whereas your colder water tails will come from Main, New Zealand and Austrailia. There are definitely taste differences between the two. A cold water tail will have meat that’s whiter in appearance and it can be more tender due to the slower growth in colder waters. Those who eat cold water tails will also tell you the tails can have a “cleaner” taste. Due to the sensitivity of the order, shipping fees can apply if you were purchasing online. Depending on the retailer, these shipping fees can be in the $15 to $45 range; however, the retailer may waive them if you meet a certain order requirement. Ask the retailer before you buy to see if it’s a warm or cold water tail. If the retailer doesn’t know, then it’s best to look elsewhere. Closely examine the tails. If you notice any yellow spots, then this could indicate the tails came from warmer waters. Black spots are a sign of lobsters weren’t handled well and should be avoided. If the tail is gray, it could indicate the lobster wasn’t alive during processing. Smaller tails are typically the best because of the flavor. If you want a simple recipe at home, consider this Food Network baking recipe. When choosing a retailer, always research their reputation online to ensure you’re buying a quality product. If you do see a fantastic price that’s too good to be true, then there’s a good chance it’s a warm water tail that won’t have as much flavor. The best time of year to buy lobster tails will be in the winter months. Some retailers, such as Costco, will sell in bulk by the case. If you were to need 10 or more pounds, you could save a few dollars.